"Flour tortillas filled with a tomato-chicken mixture and topped with a simmering salsa mixture, then baked with cheese and olives on top. Really tasty! This recipe is easy and delicious." In a large bowl combine the chicken, sour cream, canned diced tomatoes, 1 teaspoon chili powder, chopped onion, green onion, and fresh diced tomato. Mix well and set aside. In a medium saucepan combine tomato sauce, salsa, 2 teaspoons chili powder, oregano and parsley. Bring to a boil, then reduce heat to low and simmer for 10 minutes. Fill tortillas with chicken mixture and fold together, laying snugly in a lightly greased 9x13 inch baking dish. 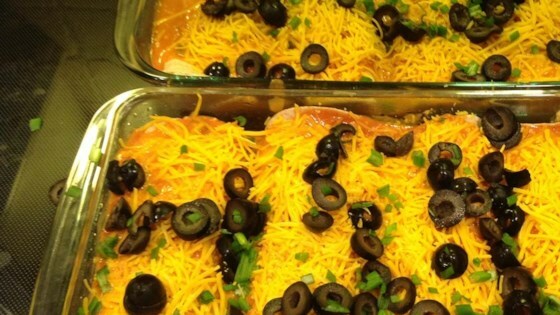 Pour simmered sauce over the top, then sprinkle with shredded cheese and chopped olives. Bake at 350 degrees F (175 degrees C) for 30 minutes, or until cheese is melted and bubbly. An irresistible and cheesy-good Mexican dinner! I baked it covered, and it turned out a bit soggy. Tasty dish. I omitted the chopped tomato and baked the enchiladas sauceless for the first ten minutes to help with the sogginess problem.